Rpt Round 2 until 10 rounds have been worked in all. Turn. Working in dc not tr's, rpt last round once. Fasten off. Working in dc not ch's, rpt last round once. Fasten off. Finishing - Weave in and trim all loose ends of yarn, decorate with buttons over ss seam. 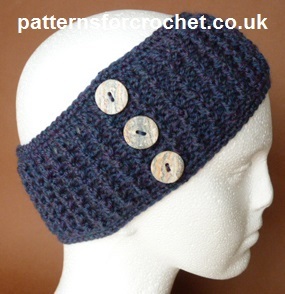 Hope you enjoy this free crochet pattern for a headband ear warmer.